If you’re bored with digitally crafted and default wallpapers, and looking for something eye pleasing, then there is no alternative for Birthday wallpapers. Birthday HD wallpapers app comes with high resolution, eye pleasing Birthday wallpapers. when you unlock your phone a Birthday wallpaper welcomes you. If you spend lots of time with your iPhone, then it is very much essential that you must use a wallpaper that keep your eye cool. It is proved that, pictures can control your emotions. 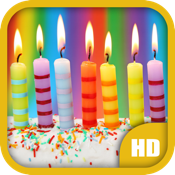 Here are the cool HD Birthday wallpapers completely free and gives you the opportunity to download the wallpapers directly on your mobile without being redirected to any website. You can download the wallpapers in different sizes. The wallpapers are specially optimized for iPhones & iPads.